Hi everyone, Deanna here back with another inspirational blog post for you all. Here is my project. My card base is a 4 1/4" X 5 1/2" Kraft card base. I added a black mat cut at 4 1/8" X 5 3/8". 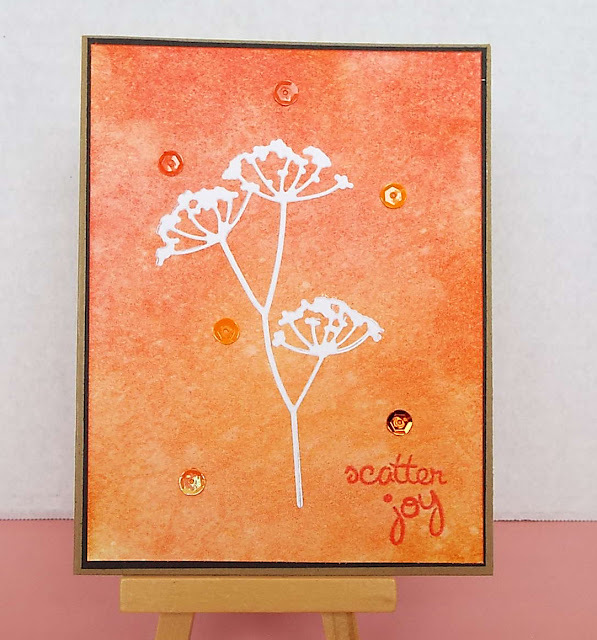 Next I took a piece of water color card stock and used distress inks to create my background color. I used Rusty Hinge, Ripe Persimmon, and some Abandoned Coral inks, I was going for a nice orange sunset look. Next I cut the card stock down to 4" X 5 1/4". I used the Adelaide Memory Box die to cut my image out of white card stock. I adhere the die to the water color card stock and added some sequins to the card and stamped my sentiment. Beautiful CAS card, I love your coloured background. Such a pretty card with lovely sinner colors! Love that white die cut, really POPS against your pretty background! Great card for almost any occasion and so versatile by just changing up the color of the background. Love the orange for this time of year. Lovely sunset colors for the backdrop to the pretty wild flowers! Very pretty Deanna ... love the color and wonderful, mailable design! This is so pretty! Love the background color. You definitely achieved the sunset look!